Did you know that there are simple things that could lead to your insurance claim being rejected. Check this post to make sure you never have your claims rejected again. We all have insurances of various kinds and rarely bother as to how the process of claim settlement goes. We also rely too much on the insurance ‘advisors’ and ‘agents’ to do the needful to make sure we get the insurance plan we are looking for and at the best possible (meaning cheapest possible) premiums. But do we ever bother to wonder if the agent will fill the form thoroughly or will there be any scope of human error? Even slightest of mistake or over enthusiasm of the agent or advisor can lead to your insurance claim being rejected. Be well aware of this hard fact. Your insurance claim will be rejected or if it already has been, then below are the 7 possible reasons that caused your insurance claim rejection. These 7 basics are true across all forms of insurance. While taking a policy you are asked various questions ranging from your income to your lifestyle to family health details. Any information wrongly given at this stage is the basis of claim rejection in the future. Your premiums are based on the facts about your lifestyle and by giving false information you may save a few hundred or a thousand annually but will lose out in the long run. For instance if you are a smoker or have occasional alcohol, make sure you inform this to the company truthfully. Disclose your proper annual income if asked, since that determines the Human Life Value, and often your sum assured is based on this. Trying to get a higher sum assured by giving misleading income details can be a reason why your insurance claim will be rejected. If you provide wrong medical information regarding any medical history you may have had or conceal any other information like hospitalization in the past or some hereditary disorder, this will lead to your insurance claim rejection in the future. Get one thing straight, any and I mean absolutely any detail about your medical conditions or any pre-existing diseases should be provided to the insurer and that includes any material medical condition of your parents too, even if they do not demand a medical test. It is always a great idea to insist and go for medical examination at a centre approved by your insurer to rule out any issues with your medical history at the time of claims. The biggest mistake that almost all of us make is we let your ‘agents’ or ‘advisors’ fill in the details in our insurance application and information forms. Any mistake from their side or even a smallest of thing overlooked by them can lead to claim rejection. Don’t be lazy, it takes a few minutes and hence fill the forms yourself, check it twice before signing and submitting it. It could be any mistake, for instance you are a smoker and all you have to do is tick the ‘Smoker’ check box, but your agent just forgot or overlooked that. Now your insurance provider puts you in the ‘Non-smoker’ category and your premium is charged accordingly. At the time of claim, this will lead to your insurance claim rejection. You only get the benefits of the policy which is in effect or is still active. This happens only if you have been regularly paying your premiums. Make sure you do not forget or skip any premiums as if the policy lapses, your nominee or anyone going to make a claim, will have it rejected by the company since the policy would have lapsed. At times you make someone your nominee and then over the years forget to update it in your insurance policies in case the nominee themselves have deceased. This is very common reason why your insurance claim will be rejected. For instance, while you are single, you may have your parents as nominee, but as years go by, you get married have kids and it maybe that your parents are no more. At this stage make sure, your nominee is either your spouse or your kids or someone alive whom you want to be the beneficiary. Always make sure your nominee details are updated. Also inform the nominee about the claim settlement process so that they can do the needful when the time comes. If you have been careful with all of the above points also make sure you are mindful of this one. Go through your policy details thoroughly when your policy is being signed and also when the document is sent to you. Usually insurance companies have a window of 15-30 days in which you can either stop the policy or make changes in case of mistakes of any other relevant reason. Read your policy terms and conditions and all your personal information carefully and make sure it is error free. Also it could be that while taking the policy the agent promised you something that is not there in the policy document, sort this out with the insurance company to avoid any surprises later. For instance in case of a mediclaim, there are certain conditions for hospitalizations for your claim to be approved, you need to be aware of those to get your claim approved. Certain types of insurances have a time frame within which the claim must be made after the event occurs. For instance in case of health insurance, there is usually a 24 hours to 48 hours window to inform the insurance provider about the hospitalization in order for the claim to be processed. If you delay in this case, your claim will be rejected. If there is any particular time frame that you need to make the claim in, doing so later may lead to your insurance claim being rejected. Disclose all information honestly, read the policy document carefully, and cross check everything while purchasing the policy to avoid your insurance claim from being rejected. If you have taken care of everything from your side, and still there is an issue of rejection, you can appeal with IRDA or approach the consumer court if the company is adamant in spite of exploring all other options. 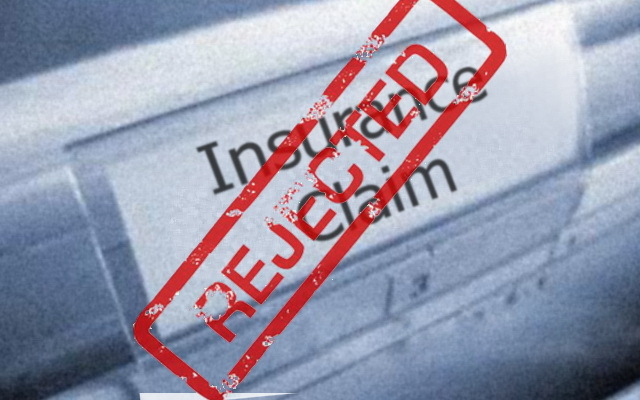 Remember one thing, Insurance is a contract between you and the company providing you insurance, and hence like any other contract any act that leads to any breach of contract or is not in good faith, will lead to the contract being null and void and in case of insurance, this is why your insurance claim will be rejected.